Note: In the continued spirit of the 2017 CrossFit Games Open, todays workout comes from the 2009 Iceland Qualifier (currently referred to as “Regional”.) Athletes will need to adjust the weight themselves either before or after their run. There is a twenty minute time cap on todays session. Scot (One T) is Athlete Of The Week! Congratulations to Scot who was recognized as Athlete Of The Week. Since his first workout, Scot has been a huge part of our community, and a force to be reckoned with during the training sessions. Scot was part of our coaching team for several months before a promotion at work demanded he focus solely on his own training. 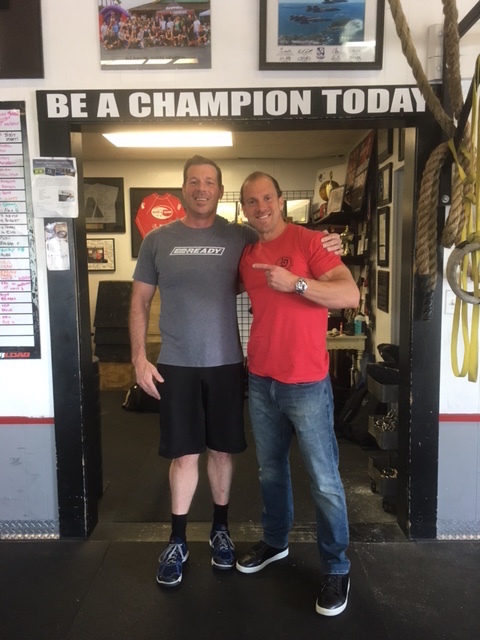 Scot has a keen sense of proper technique and body mechanics, and newer athletes always appreciated his kindness and humility during his classes. In the workouts, Scot is an absolute powerhouse, who frequently “scales up” in weight. Scot’s discipline to mobility and working the “chinks in the armor” is inspiring to all who know him. Scot’s career is now requiring his relocation to Oakland! We are going to miss him immensely. Keep spreading the good word in integrated fitness Scot, and we hope to see you in the near future. We love you man! 6:15 PM – 7:00 PM Krav Maga Bag Yellow Belt Series Begins!